We are a fully insured and licensed, locally owned roofing company. Our number one goal is to achieve and exceed our customer’s satisfaction. H AND S LLC is a proven roofing company that continues to meet our customers’ expectations. In 2000, we noticed a need for quality workmanship at a fair price. We pride ourselves on providing our customers with experienced roofers, top quality materials from major local distributors. Enclosed in our estimate folder you will find a list of shingle brands and color for you to view to assist with your decision making. We get over 75% of our work from customer referrals. Occasionally unforeseeable problems can arise we are quick to communication the situation and work with you for resolution. Our goal and success is based upon your completed satisfaction of your project. The experienced crew assigned to your project will typically have 6 or more members, starting at between 7-8AM. The crew will daylight to complete jobs. Most roofs take approximately 1 -2 days to complete. Crews will work diligently through early evening to complete your project in a timely manner. 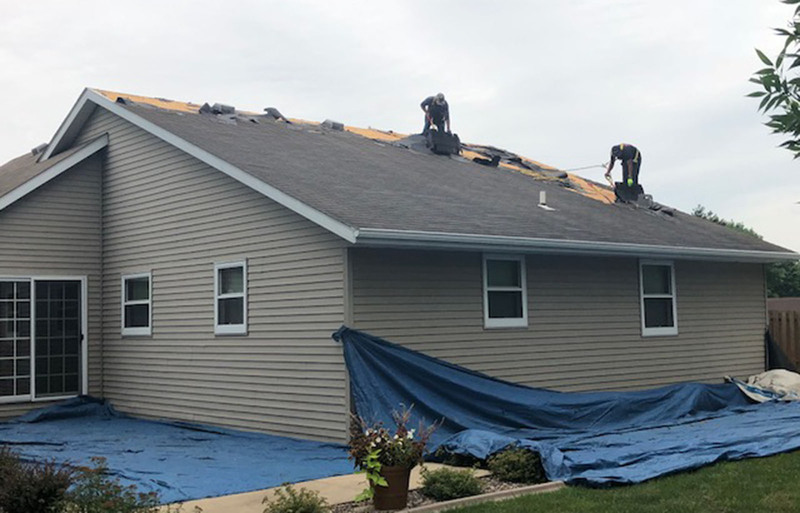 You will not find another roofing company in the area that will complete your roof project as quickly and professionally as H AND S LLC. Don’t worry, as a service to you H AND S LLC will source all required permits for your area. H AND S LLC is a proud member of the Brown County Home Builder’s Association since 2003. H AND S Roofing LLC has experienced estimators and knowledgeable support staff. We offer a 10 year workmanship warranty with a full roof replacement, commercial or new construction. Our goal is to get you an estimate via email, postal mail or both within 3 business days of your request, location and weather dependent.